This bulletin features the latest production outlook for the major producers in the southern hemisphere and some isolated northern hemisphere countries where crop development is sufficiently advanced.. Focusing on the months of October 2018 to January 2019, chapters cover global, national, and regional-level agroclimatic conditions and the condition of crops that were growing or harvested during this time. 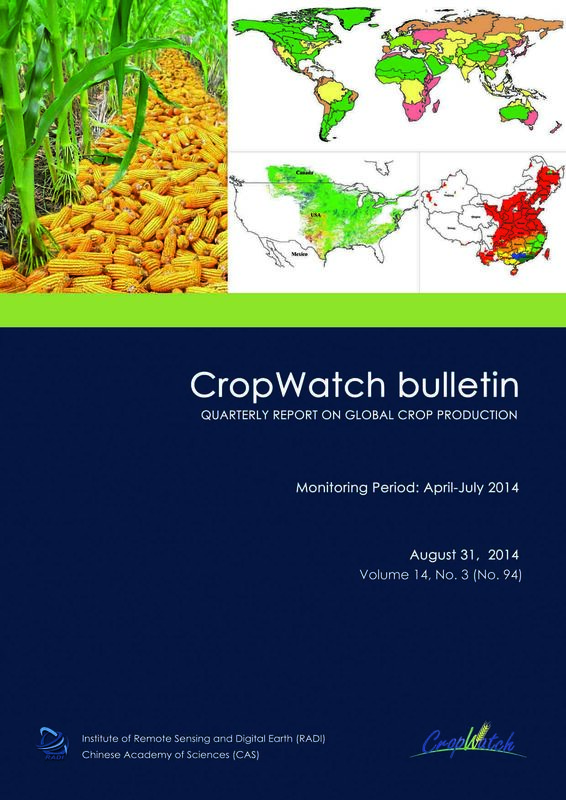 For China, the bulletin presents crop conditions for each of seven key agro-ecological zones. The focus section reports on recent disaster events with an impact on agriculture, the possibility of an El Niño event. August 2016 CropWatch bulletin released. This most recent CropWatch bulletin focuses on crops that have already been harvested in 2016 as well as those that were growing between April and July, to be harvested later this year. The bulletin covers prevailing weather conditions, resulting crop condition, size of cultivated areas, and global food production, paying special attention to the thirty major agricultural countries and maize, rice, wheat, and soybean crops. For China, regional conditions and an update on pests and diseases are presented, along with new sections on trade prospects for major crops and an outlook for domestic crop prices. Other focus areas for this bulletin are the drought in Morocco and agriculture in Southwest Asia. May 2016 CropWatch bulletin released. 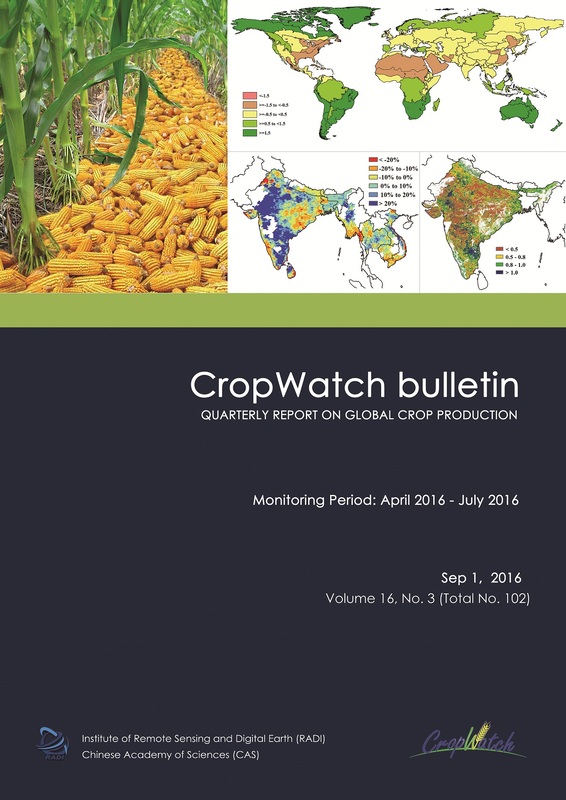 This latest CropWatch bulletin presents the first global production estimates for 2016, combining information from remote sensing data with trend-based analysis. The bulletin further presents an update on the agroclimatic and crop condition for January-April 2016, focusing on crops that were either growing or harvested during this period and covering key global production areas and major worldwide producers and exporters of maize, rice, wheat, and soybean. For China, regional conditions and an update on pests and diseases are presented. The bulletin’s focus section highlights recent disaster events, agriculture in Central Asia, and the declining El Niño effect. 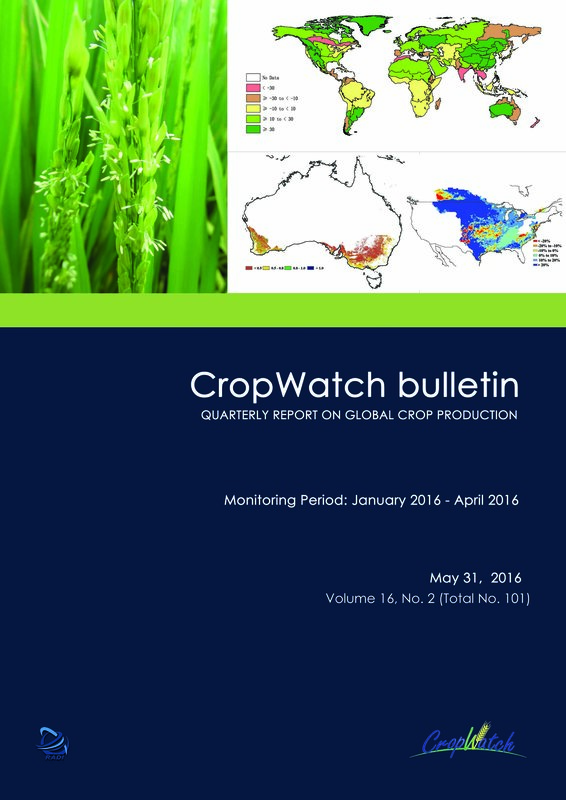 February 2016 CropWatch bulletin released. The latest CropWatch bulletin assesses worldwide food production and other events of agricultural interest for the period October 2015 to January 2016. The bulletin as always relies on environmental and satellite-based agronomic indicators combined with other available agricultural data. A particular focus area for this bulletin is the Zambezi basin in Africa; the issue further describes other ongoing trends, a focus on Chinese domestic crop prices, disaster events, and El Niño. 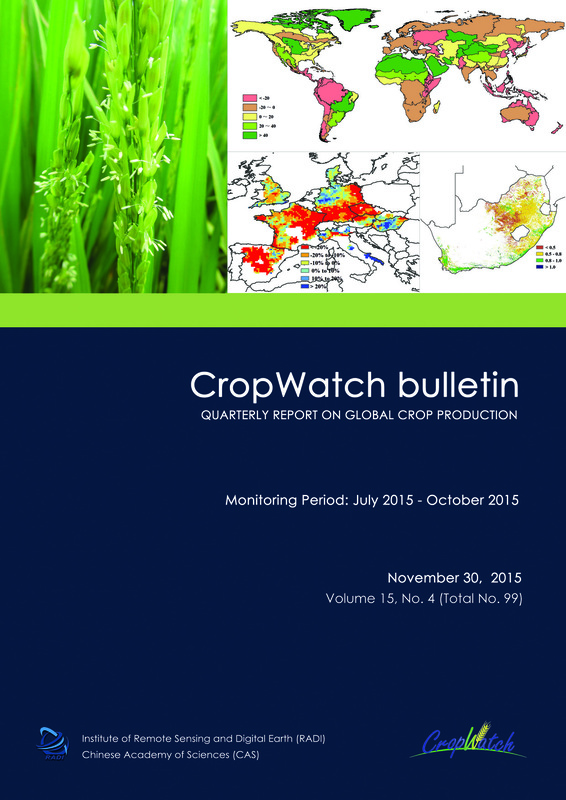 November 2015 CropWatch bulletin released. The latest CropWatch bulletin assesses worldwide food production and other events of agricultural interest for the period July-November 2015. The bulletin as always relies on environmental and satellite-based agronomic indicators combined with other available agricultural data. A particular focus area for this bulletin is production and trends in Europe; The issue further describes other ongoing trends, a production outlook for 2015, disaster events, and El Niño. 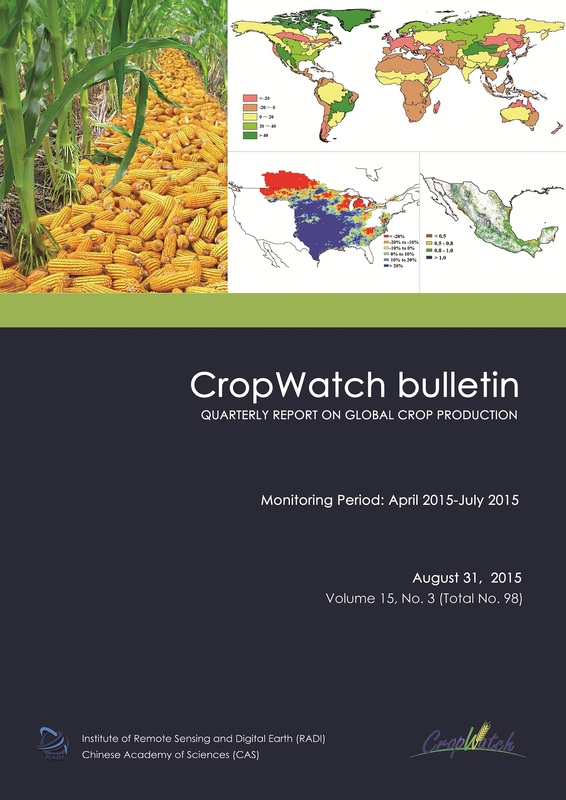 May 2015 CropWatch bulletin released. The current CropWatch bulletin is based mainly on remotely sensed data. It focuses on crops that were either growing or harvested between January and April 2015. The bulletin covers prevailing weather conditions, including extreme factors, as well as crop condition and size of cultivated areas, paying special attention to the major worldwide producers of maize, rice, wheat, and soybean. The bulletin also describes current conditions in China and presents the likely global production prospects for crops to be harvested throughout 2015. A special focus section describes agricultural developments in South America. 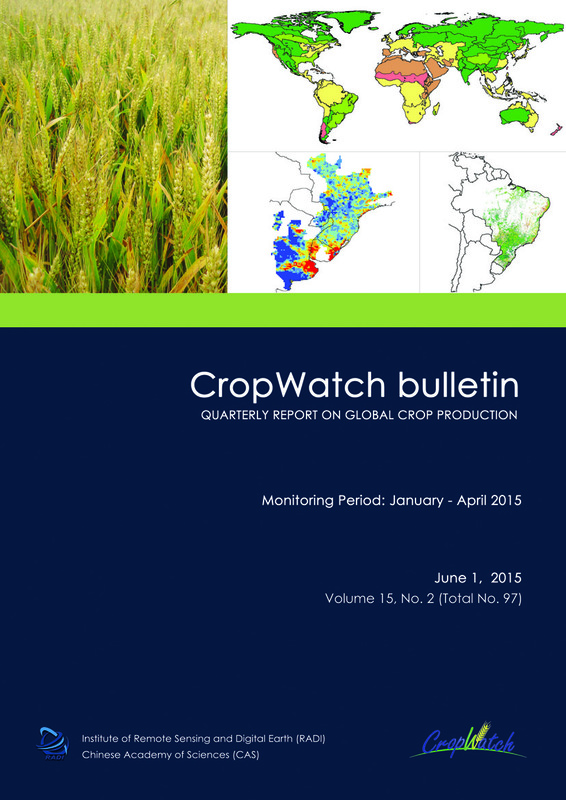 February 2015 CropWatch bulletin released. 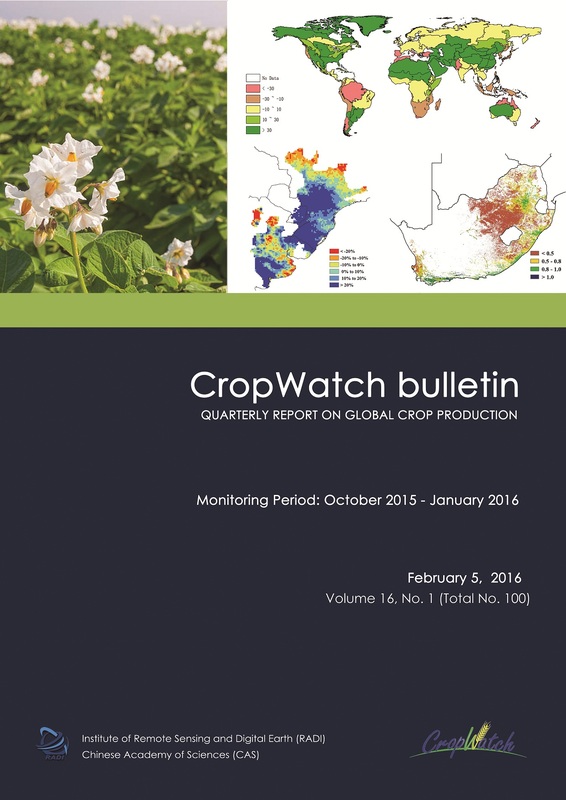 The CropWatch February 2015 bulletin presents an overview of global and regional crop development and agricultural production up to the end of January. The bulletin’s analyses of agroclimatic and satellite-based agronomic indicators focus on worldwide patterns and zoom into major production areas, countries, and large administrative areas. Although the latest reporting period covers a relatively quiet period from an agricultural standpoint, as described in the bulletin global weather and extreme weather events have caused damages to agriculture or will otherwise impact agricultural outcomes for the next season. The bulletin includes updated estimates for wheat production in Argentina, Brazil, and Australia, as well as a focus section on agricultural development in Africa. 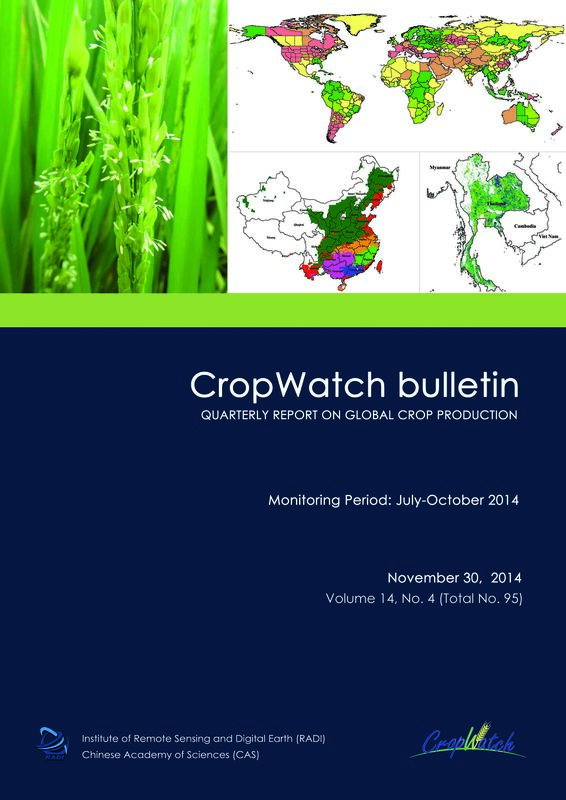 November 2014 CropWatch bulletin released. 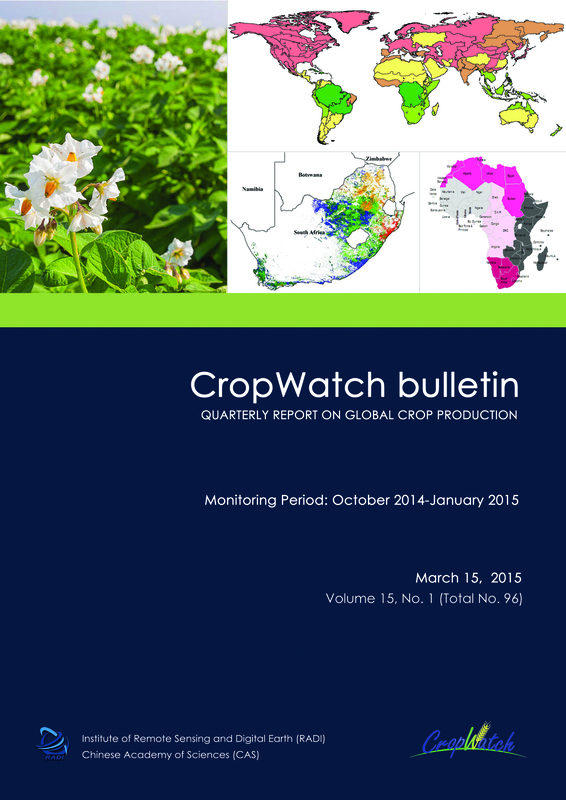 The CropWatch November bulletin assesses the agroclimatic and agronomic factors up to October 2014 that determine crop development and agricultural production. The analyses of environmental and satellite-based agronomic indicators focus on worldwide patterns and zoom into major production areas and countries. The report presents the CropWatch provisional estimates for 2014 production, putting the combined global estimate of 2014 maize, rice, and wheat output at 2,469 million tons and soybean at 295 million tons; for China, these numbers are 513 million (main cereals) and 13 million (soybean). The bulletin’s focus section this time discusses extreme weather events—including cyclone Hudhud in India, El Niño developments, and rice. The CropWatch August bulletin assesses the agroclimatic and agronomic factors up to July 2014 that determine crop development. The analyses of environmental and satellite-based agronomic indicators focus on worldwide patterns and zoom into major production areas and countries. Over the reporting period, rainfall deficits and excess rainfall both markedly affect crop development. The bulletin reports on 2014 crop production estimates and also summarizes recent disasters and severe weather events that have impacted agriculture. The focus section further discusses El Niño perspectives and recent trends and an outlook for maize. 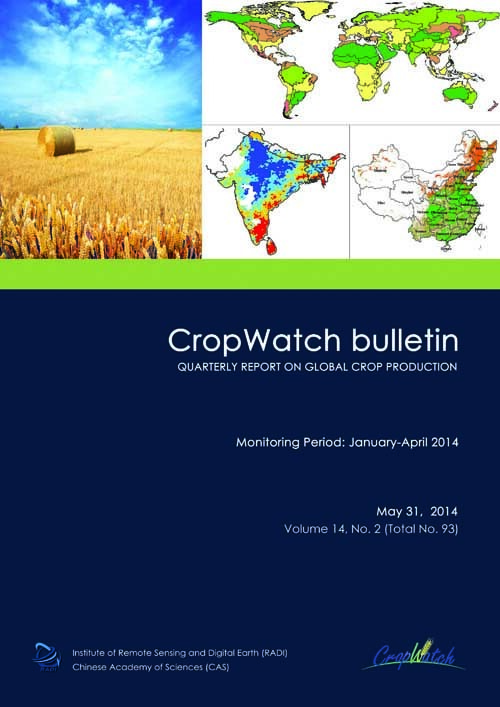 The May 2014 CropWatch bulletin (Vol. 14, No. 2) summarizes global crop condition developments and agroclimatic factors from January to April 2014, focusing on key crop producing and exporting areas and China. The bulletin reports on cold spells, warm spells, and droughts affecting large areas, with resulting impacts on regional and national agricultural production. Findings also include that some of the observed climatic anomalies are in line with El Niño induced weather patterns. 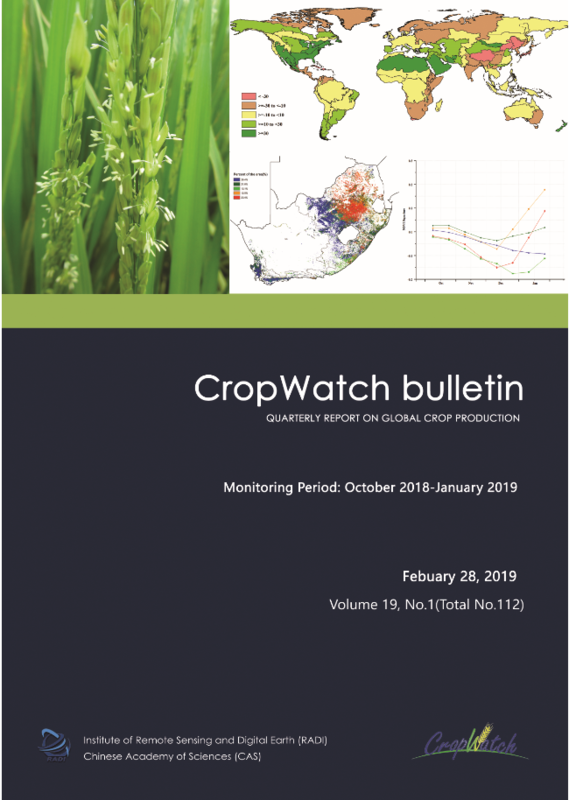 The report lists current production estimates for maize, rice, wheat, and soybean for calendar year 2014, using CropWatch information on crop condition and areas of cropped land compared to recent years. The bulletin’s special focus is on disasters, wheat, and El Niño.